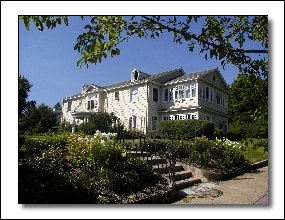 Stange Manor Bed and Breakfast is considered the finest older home in Eastern Oregon. This historic mansion offers timeless elegance and warm, friendly hospitality. The Stange home is a Georgian Colonial, two floors with a full basement and a rough-finished attic, a total of about 9,000 square feet. It has four bathrooms upstairs, one per sleeping area, highly unusual in that era. All floors are oak, the multitude of closets are all cedar lined. Queen beds, private baths and great breakfasts make Stange Manor a favorite of both casual and business travelers. we enjoyed your Stang Manor the most by far!" Plan your visit to Pendleton.